The Chicago Book Online Business Profile -- Fitzgerald Equipment Company, Inc.
Fitzgerald Equipment is a third generation, ­locally owned materials handling company ­adjacent to the Chicago Rockford International Airport. They distribute and service forklifts, pallet jacks, industrial scrubbers, boom lifts, dock plates, and maintenance vehicles. They also have an extensive catalog which includes racking, decking, industrial tables, cabinets, and more. Fitzgerald’s largest partner is Hyster-Yale Group, an American made full line of lift trucks and motorized hand trucks. 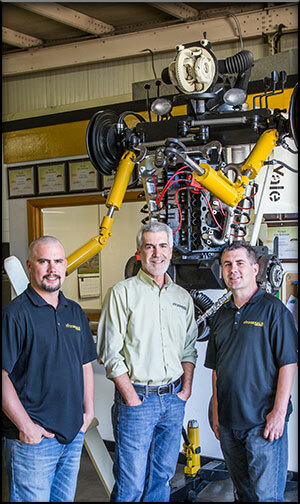 Hyster-Yale has ­honored Fitzgerald Equipment as a Dealer of ­Excellence more than once for their industry-leading level of performance and service. Fitzgerald’s coverage area extends from southern ­Wisconsin, suburban Chicago and the Iowa border down to south central Illinois and east toward the Illinois/Indiana border. In addition to its Rockford headquarters, the company added a second location in Mackinaw, IL, in the 1970s. They have a fleet of well stocked service vans for on-site service and maintenance as well as 24/7 emergency services available. Kevin Fitzgerald, current president, has been an ­employee with the company for more than 4 decades. He points out his industry’s amazing technological ­advancements throughout the years. “Today, there are lift trucks that can be programed to self-drive through a warehouse to pick up items off a shelf. The truck pretty much does it by itself.” These changes were no doubt unimaginable to Eugene, Kevin’s father, when he first built the small company in 1962. He had probably not fathomed the growth the company would see in the next 50 years. “The majority of our people are service technicians and the remainder includes sales, management and office support.” Kevin says, “One of the best things that we’ve got going for us is that we have a lot of really good people. They build relationships, they are honest and they do what they say,” crediting the employees for the companies continued success. Contributing to their success are third generation Fitzgerald’s, Eric, vice president and Mike, parts manager. Kevin and his sons all started working with the company at young ages. “I started much like my dad: scrubbing walls, cleaning, and stripping down scrap forklifts in high school,” Eric recalls. “We are only as good as our employees. We treat every employee as a member of the family: some have been here for more than 40 years. Our employees have the freedom to make decisions in the best interest of the customer. Our goal is to make sure everybody is confident and comfortable making those decisions.” “And if one of our people make a promise they better make sure that it happens,” adds Kevin.